Whether or not you have a case is a loaded question that is complicated by a near-infinite number of variables. If you were hurt in an accident that wasn’t your fault, you should talk to one of our local Erie, PA attorneys to see if it’s worth retaining a personal injury attorney. It’s free to sit down with us and see if we can help. With offices in both Erie, PA, and Smethport, PA, we represent victims throughout northwestern and north-central Pennsylvania. What your car accident case is worth involves a number of factors. In a settlement, you can potentially be compensated for both your economic (lost wages, medical bills, out-of-pocket expenses) and non-economic (pain and suffering) damages. The more economic losses and the more severe your injuries are, the more your case is worth. Typically, it’s impossible to determine how much your case is worth until the full extent of your injuries is known. It makes sense to get a local, Erie, PA attorney involved as soon as possible after the accident to ensure you are taking the steps necessary to maximize your case’s value. Who pays my medical bills after an accident in Pennsylvania? After an accident in Pennsylvania, you should give the doctors and hospitals your car insurance information—your health insurance only kicks in after your available medical coverage under your car insurance runs out. If you don’t have auto insurance, there is a complex statute in place to determine whose insurance pays. As part of our representation, we help our clients sort out their medical bills. Can I see a doctor or a chiropractor? What if I don’t have health insurance? Pennsylvania auto insurance pays for a wide variety of types of medical care—not just hospitals. You are free to see a specialist or a chiropractor without the need for a referral. It doesn’t matter whether or not you have health insurance; your car insurance should have at least $5,000.00 of available medical coverage. If you don’t have car insurance, there still might be car insurance available to you from other parties depending on the circumstances surrounding your accident. Who pays my lost wages after a car wreck in Pennsylvania? In Pennsylvania, ultimately, the insurance company for the person at-fault should pay for your lost wages—unfortunately, this only takes place with a final settlement of your case and can take years. If you have wage-loss coverage through your own insurance, your own insurance will promptly cover a portion of your lost wages for a period in time. If your injury was serious enough to take you out of work for any period of time, it’s serious enough to warrant retaining a personal injury attorney to make sure everything is handled properly. Don’t try to settle your personal injury case on your own. Am I entitled to money for my pain and suffering? In Pennsylvania, whether or not you are to be compensated for your pain and suffering depends on whether or not you elected “full tort” or “limited tort” car insurance. If you elected “full tort,” you’re entitled to be compensated for your pain and suffering. If you elected “limited tort,” it depends on a number of factors including the severity of your injury, what sort of car you were in, what sort of car the at-fault party was in, the condition of the other driver, etc. If you don’t know whether or not you have full tort, please read our page about understanding car insurance coverage. What if I’m driving a car for work? If you are in the course of your employment during an accident, whether or not you were at fault, you might also have a workers’ compensation claim. These sorts of cases with work injuries and auto accidents involved are extremely complex and require a local Erie, PA injury attorney from day one. At our firm, we handle both workers’ compensation and car accident cases; we’re extremely experienced in making sure both of your cases flow smoothly and do not negatively affect one another. What if the person that hit me didn’t have insurance? 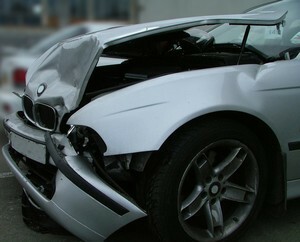 It is surprisingly common how many people that cause accidents are uninsured. This can leave you in a difficult situation wherein you cannot be compensated for your injuries. Fortunately, you can (and should) purchase uninsured motorist coverage from your own car insurance provider to protect against exactly this. Our law firm frequently obtains settlements for many persons injured by uninsured drivers. The person that hit me drove away! What can I do? If you were involved in a hit-and-run accident, you need to immediately call the police and have them write a report. The police will document the hit-and-run and will try to find and interview witnesses. While Pennsylvania uninsured motorist coverage covers injuries from hit-and-run accidents, most insurance companies require you to report the accident to the police as soon as possible. Failing to make a police report can eliminate your only source of recovery. Should I handle this outside of insurance? You should never let another driver talk you into not calling the police and “handling it outside of insurance.” Even if you don’t think you were hurt at the time of the accident, it’s not uncommon to notice injuries several days later—long after the other person’s story has changed and they are now blaming you for the accident. If you’re in an accident, call the police to investigate and write a report. Even if you weren’t hurt. The police will perform an investigation and interview witnesses; don’t let it be your word against theirs. Is the insurance company offering me a fair settlement in Pennsylvania?? If you have to ask whether or not a settlement is fair, the answer is “probably not.” Insurance companies very rarely offer unrepresented parties the same amount of money they offer persons with attorneys. Even if you are savvy and are a good negotiator, insurance companies know that if you don’t have a good attorney, you really can’t sue them to make them pay more. A local attorney can typically obtain you settlements that leave you much better off—even after their fee. Here are four signs the insurance company isn’t offering you a fair settlement. If you are still unsure, we’d be happy to sit down with you for free, analyze your case, look at your offer, and determine if we’d be able to get you more if you retained us. Our Erie, PA law firm only gets involved if we think we can help you. You should never, under any circumstances, provide any insurance company with a recorded statement without first consulting with an attorney. This rule even applies when it is your own insurance company asking for the recorded statement. The sole purpose of obtaining your recorded statement is for the insurance adjuster to create a formal record unfavorable to your claim before you have legal representation and before you may even know the full extent of your injuries. The insurance adjusters are trained to create a record that they can and will use against you. For more information as to why you should never provide such a statement, read our article Should I give a recorded statement to the insurance company?